What is Strategy at CAS? “Operational Effectiveness is necessary but not sufficient …The essence of strategy is choosing to perform activities differently than rivals do… Strategy is the creation of a unique and valuable position involving a different set of activities… than rivals engage in." To bring this back to craft beer: Making ales and flavorful beers very different from traditional industrial lagers has allowed craft breweries to sustain their competitive position and consistently erode market share from InBev, Miller, Coors, and other legacy breweries. This worked because visionary brewers and entrepreneurs believed that food and beer culture was shifting in a way that would favor craft, and they moved strategically to position themselves to take advantage of that future reality. Porter also points out that deciding what not to do is just as important as deciding what your firm should do. Rivals will quickly copy a successful competitive strategy, often producing similar products to match changes in consumer trends. “Tradeoffs create the need for choice and protect against repositioners and straddlers” (Porter, 1996: 68). Even though it seems like every craft brewery in the Pacific Northwest makes an IPA, there are several recent entrants that choose another route. Occidental Brewing (Portland, OR) makes only German style ales, The Commons Brewery (Portland, OR) makes Belgian styles, and Crooked Stave Artisan Beer Project (Denver, CO) focuses on sour beers. Each of these firms is completely capable of making a great IPA, but their strategies don’t allow for it. Oakshire Brewing made the difficult decision to stay out of the food business, and pioneered the tactic of partnering with food trucks. Rather than try to explain strategy in an isolated fashion like Porter (1996), we suggest strategy is inextricably integrated with leadership and innovation. 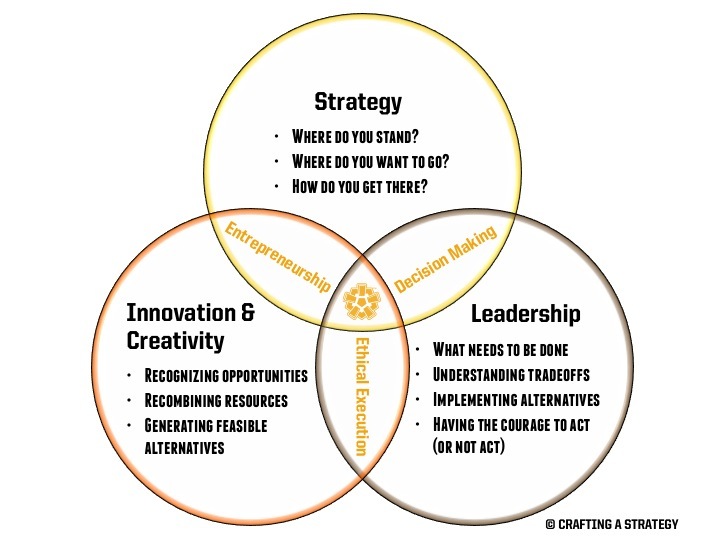 Figure One “CAS Model of Strategy in Action,” shows the overlap of strategy, innovation, and leadership. By working with this framework management can focus on what to do, what to not do, and why. We encourage brewery owners to self-determine what the business should do based upon why they created and choose to sustain the business, their core values, and dreams. Decision-making fits leadership, culture and value systems with goals and strategic actions. A focus on maximizing operational efficiency and incremental product and process innovation is currently driving a merger between InBev and SABMiller , two of the largest mass-market beer corporations. However, the marketplace is shifting in a way that offers opportunity for firms that can be more agile, innovative and flexible with their business models and product lines than the large mature companies. Craft breweries are seizing this innovation opportunity at the market share expense of large corporate breweries. Breweries like Budweiser and Heineken simply cannot afford to give up any efficiencies because margins would no doubt shrink, and shareholders would scream! They are stuck; trapped by the rules of their own strategy. Holloway, Meckler and Brymer reported this emerging industry disruption in a May 2016 article. Innovation and creativity are at the core of the craft beer movement, and a strategic approach in these areas will allow breweries to profit from their creativity, not simply churn out a wider variety of delicious beer. At CAS, we organize the creative process to allow for innovation. Strategic innovation organizes creative processes around the correct resources and an economic model that allows for appropriate scale and adequate efficiency. For craft breweries and craft brew pubs, maximizing efficiency isn’t the answer at this point. The answer in the year 2016 is producing different and flavorful beers that the craft beer marketplace is demanding, and attracting motivated craftspeople as employees, even if margin percentages end up lower. Of course, too much on the creativity side may end up costing too much. Once again there are tradeoffs. The key is to develop an adequate efficiency for the scale and mission you are trying to achieve, allowing enough inefficient creativity for achieving the innovation demanded by your mission, vision and of course, the marketplace. Nearly everything else you do must be carefully organized to produce and keep the balance between the effectiveness of the innovation you need and your minimum adequate efficient scale. Here is a sampling of CAS papers that guide the craft-brewing entrepreneur from creativity through invention, and to innovation. How Do Consumers Value Products And Services? How Many New Products Can I Make While Still Making Money? How Should I Recombine Resources And What If It Cannibalizes Old Ones? The classic first strategy question: “where do you want to go,” is and should be, more of a leadership issue than a strategic issue. We frame it as “What Needs To Be Done.” It is the responsibility of the principals of the business (the owners, directors, the board) to decide upon the mission and explain their vision for the firm. It is an abdication of leadership when these critical decisions are not made and communicated. The principals of the firm then hire “agents,” like general managers, master brewers and CEO’s, to come up with strategies to achieve that mission and realize that vision. In many craft brewing businesses, the owners are also the managers, filling a dual role. For them, the mission and vision are self-evident. However, as the brewery business grows and other agents are employed, the original founders must learn to communicate the mission, expectations, beliefs, hopes and values clearly enough so that those who agree and are motivated by those principles stay and contribute, and those who do not tend to move on to other employment opportunities. This is the fundamental mechanism through which a constructive and intentional organizational culture grows. How can we distribute leadership within the firm, creating a wise organization?